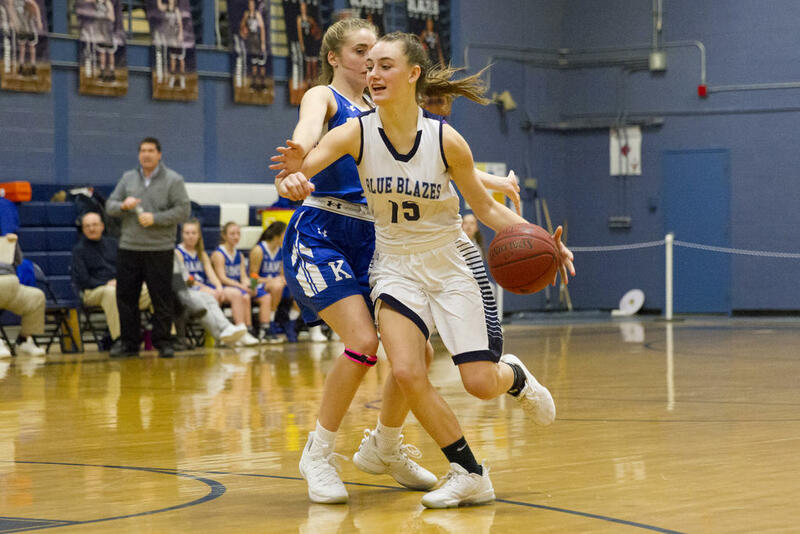 WESTBROOK—The Lady Blazes played a fantastic first quarter vs. visiting Kennebunk on Thursday evening, Jan. 31, but fell flat in the second and never recovered. Mikayla Van Zandt spearheaded Westbrook’s offense in the opening eight minutes – and put up their best number all told, 14 points – but she and her girls suffered the loss in the end anyway: 67-44 the final. Kennebunk front-loaded their scoring in the first, picking up a 17-9 lead on points by Ellen Neale, Alaina Schatzabel and others. The Blazes’ initial scores came from Abby Symbol with a three and Van Zandt with a pair of frees; the team went through a bit of a drought then, before waking up once more on a brilliant Libby Cole save at the endline: The ball heading out of bounds, Cole lunged, grabbed it and swung it back inbounds for Sydney Mullett, then regained her footing, received a return feed from Mullett and converted a layup. Cole showed off her powerful inside presence moments later with another two, bringing her girls within four at 13-9. 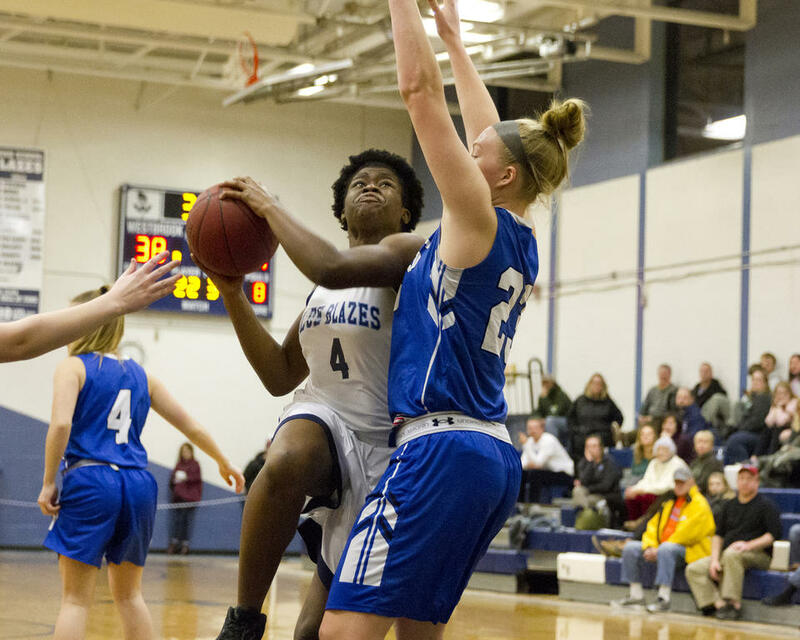 Kennebunk hashed four more and looked to pull away, but Westbrook refused to bow, and on the team’s next possession, Michaela Russell threaded a hard pass through a swarm of bodies over to Jodi Sinnett, who capitalized. 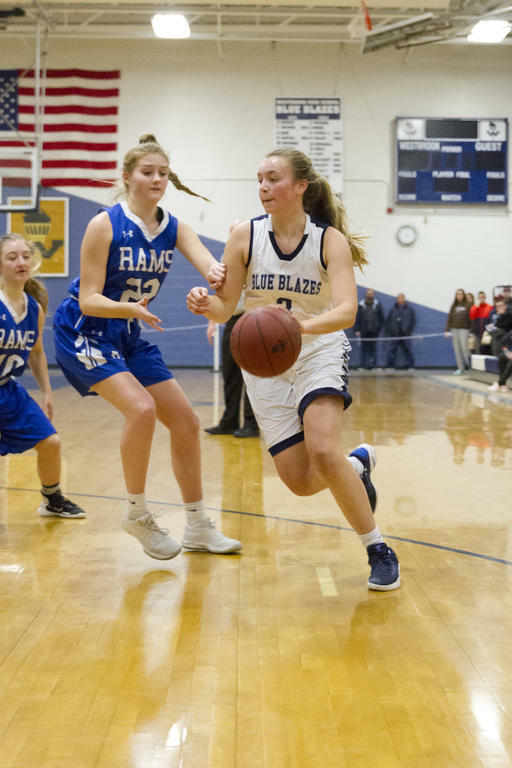 Van Zandt then added a two and two frees, and Sinnett – with just seconds to play before the buzzer – wrestled control away from a Ram on a Blazes’ offensive rebound and popped in the tying layup. 17-17. Westbrook’s lone points in the second, alas, came on a Michaela Russell three; the Rams, meanwhile, put up 15. Liz Keizulas and Emily Hogue added threes, while their teammates combined for a battery of twos and frees. 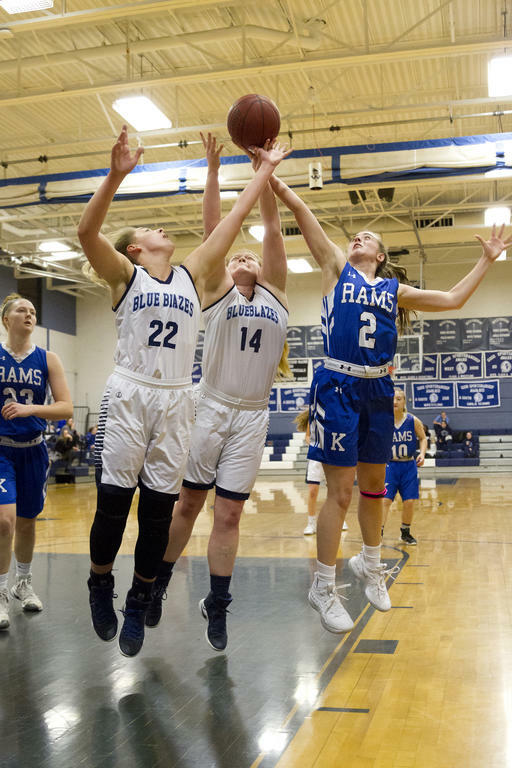 At the break, Kennebunk stood on top 32-20 – a wildly different score than that of eight minutes prior. The Blazes logged another excellent quarter in the third, when they nearly kept pace with Kennebunk. Interestingly, Westbrook committed seven fouls – at least, according to the officials they did – inside the first three and a half minutes, and the Rams scored the majority of their 17 in those eight minutes from the line. The Blazes, meanwhile, put up their 16 on a pair of Symbol threes, a trio of Van Zandt twos, an Avery Tucker two and a fee apiece from Van Zandt and Sarah Muka. 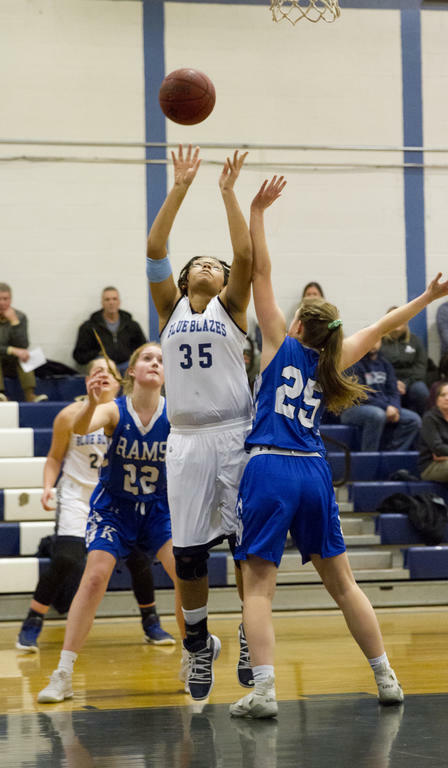 In the fourth, the Rams returned over and over again to the line, putting up 18 further points – 11 of them on frees – before the final buzzer tolled. Despite a trio of Cole twos, however, the Blazes managed just eight in the same stretch, and ultimately fell. The Blazes slipped on the loss to 3-13. Westbrook, currently ranked 12th in A South – that’s a few slots outside the postseason – would no doubt have loved to win against the Rams, given that the Rams are 10-6 at present and occupy fourth. As it is, the Blazes have two games left on their regular schedule: home vs. Falmouth (No. 11, 1-15) on Tuesday the 5th and on the road vs. Biddeford (No. 10, 4-12) two days later. Neither is liable, if it turns out well for Westbrook, to net the team enough Heal Points to extend their season. Still, it’s worth noting that the Blazes do look better now than they have in quite some time. Fans have good reason to be optimistic. For a longer version of this article and additional media, visit www.keepmecurrent.com/category/sports. Westbrookers Mikayla Van Zandt (22) and Libby Cole (14) battle a ‘Bunk opponent midair. Ariana Alcide lofts up an inside attempt for the Blazes. Avery Tucker curls inward on the attack. Quincey Lyden battles on offense for Westbrook. Sarah Muka ascends toward the net for Westbrook. 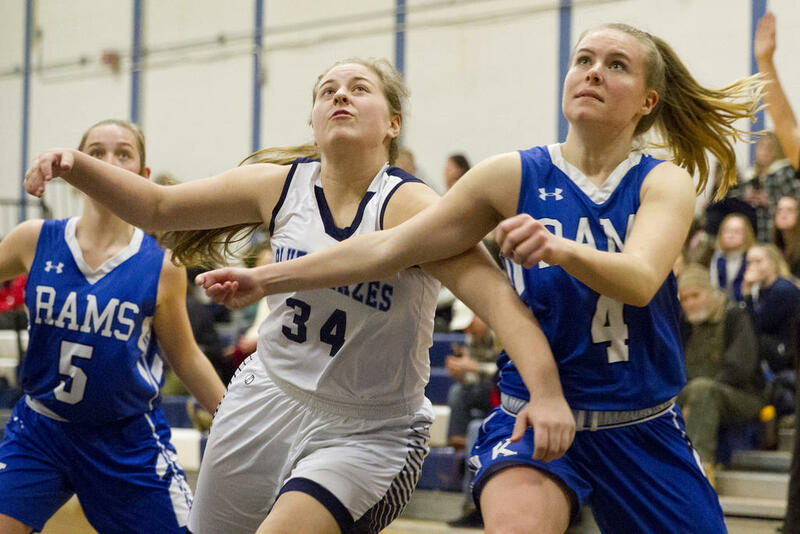 Jodi Sinnett goes shoulder-to-shoulder with a Rams enemy.